White with brown striations Vermont Marble. 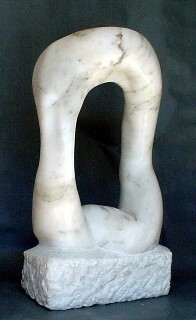 Shizukesa is one of the Tranquil Series of Sculptures. It joins other sculptures that include: Cherish, Embrace, Kanryuu, Ptolmey1, Ookawa, Secure, Taihei 1, and Taihei 2. 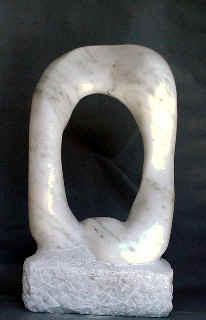 Shizukesa is a peaceful, meditative sculpture. 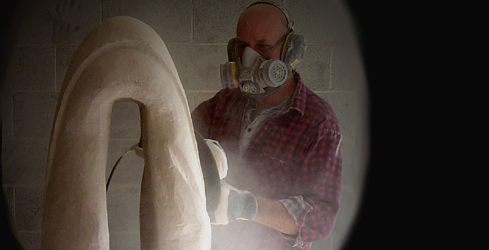 Shizukesa has smooth undulating arms which rise, curve and flow back to their folded and crossed hands on the base. Shizukesa, from its pose, appears to be meditating and encourages the viewer to also. 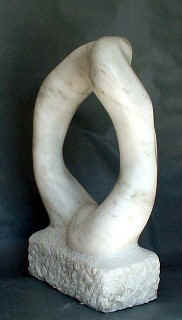 The series, Motion, Striving, & Music are about the ability of stone to move or be in motion. The Tranquil Series is just the opposite - it is the ability to be still or quiet. These sculptures are quiet but joyous works that do not have to shout to gain attention. They exist. They just are.